Question 1. Which of the following cannot be charged easily by friction? Answer : (b) becomes positively charged while the cloth has a negative charge. Question 4. Sometime, a crackling sound is heard while taking off sweater during winters. Explain. Answer : We know th at some objects can be charged by rubbing with other objects.The electrical charges produced by rubbing are called static charges. A woolen sweater while taking off comes in contact with the surface of inner clothes like shirts etc which are either made of cotton or synthetic material. Due to rubbing , or friction between the surfaces of cloth materials, where inner cloth lose some charge in the form of lose electrons, and the sweeter acquires excess of static charge. This excess of static charge, accumulated in sweater, when it comes near or in contact with body, gets discharged to either back or to ground through body, producing electric sparks with crackling sound. Question 5. Explain why a charged body loses its charge if we touch it with our hand. Question 6. Name the scale on which the destructive energy of an earthquake is measured. An earthquake measures 3 on this scale. Would it be recorded by a seismograph? Is it likely to cause much damage? Answer : Destructive energy of an earthquake is measured on the Richter scale. The earthquake measuring 3 on Richter scale, may be recorded by a seismograph and it is not likely to cause much damage as it will result in mild tremors of very low intensity on the earth surface. The earthquake measuring 7 or more on Richter scale can cause severe damage to life and property. Question 7. Suggest three measures to protect ourselves from lightning. We should avoid driving or sitting in Open vehicles, like motorbikes, tractors, construction machinery, open car etc as they being made up of metal, may induce lightening strike, hence are not safe. Similarly Open fields, tall trees, shelters in parks, elevated places do not protect us from lightning strokes. Question 8. Explain why a charged balloon is repelled by another charged balloon whereas an uncharged balloon is attracted by another charged balloon? Question 9. Describe with the help of a diagram an instrument which can be used to detect a charged body. 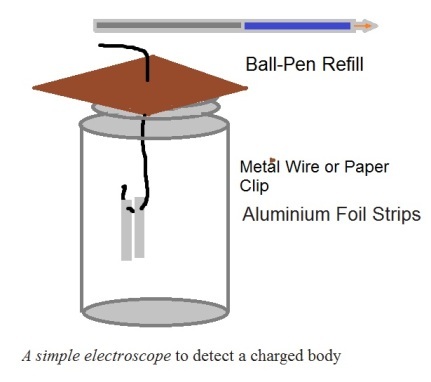 Answer : The instrument which is used to detect a charged body, is called electroscope. Such instrument can be made very easily. As shown in the figure, the mouth of empty jam bottle is covered with a piece of cardboard slightly bigger in size than the mouth of the bottle. A stretched paper clip, is inserted in the middle of cardboard as shown. Two small strips of aluminium foil about 4 cm × 1 cm each are Hanged by the lower end of paper clip inside the bottle. When a charged refill is brought in contact with the upper end of paper clip and as metals are good conductors of electricity, the aluminium foil strips receive the same charge from the charged refill through the metal body of paper clip . The aluminium foil strips carrying similar charges repel each other and they become wide open, thus showing the presence of a charge in refill body. Question 10. List three states in India where earthquakes are more likely to strike. Question 11. Suppose you are outside your home and an earthquake strikes. What precaution would you take to protect yourself? We would find a clear spot, away from buildings, trees and overhead power lines. Drop to the ground. If we are in a car or a bus, we would not come out. If moving in vehicle, would ask the driver to drive slowly to a clear spot and wait there inside the vehicle till the tremors stop. Question 12. The weather department has predicted that a thunderstorm is likely to occur on a certain day. Suppose you have to go out on that day. Would you carry an umbrella? Explain. Answer : At the event of thunderstorm prediction, while going out, We should avoid carrying an umbrella, as lightening has great affinity to strike at any available metal object in the open. An umbrella with pointed metal tube and wire frame structure inside, offers and ideal situation for a lightening strike in a thunderstorm. Some objects can be charged by rubbing with other objects. An electroscope may be used to detect whether a body is charged or not. The process of transfer of charge from a charged object to the earth is called earthing. The process of electric discharge between clouds and the earth or between different clouds causes lightning. Lightning strike could destroy life and property. Lightning conductors can protect buildings from the effects of lightning. An earthquake is a sudden shaking or trembling of the earth. It is not possible to predict the occurrence of an earthquake. Earthquakes tend to occur at the boundaries of earth’s plates. These boundaries are known as fault zones. Destructive energy of an earthquake is measured on the Richter scale. The earthquake measuring 7 or more on Richter scale can cause severe damage to life and property. We should take necessary precautions to protect ourselves from earthquakes.